The story of my getting stranded in Barcelona without kosher food and you trying to help me has now been immortalized both in nonfiction and, to a degree, in fiction. While both of us were mad at a certain-organization-that-will-remain-unnamed for this incident, the fact is, it wasn’t entirely their fault. They gave me misleading information (due to their own ignorance) that led me to come unprepared–and my being unprepared was the real issue. This time, I put a lot of thought and effort into preparing! I decided to write this post as a guide for kosher-keeping travelers or visitors–or non-kosher-keeping hosts who would like their kosher-keeping friends or family members to feel comfortable and enjoy themselves in their homes. However, a word of caution to those in the latter category: I wouldn’t advise trying to prepare kosher food yourself. When you’re not used to keeping kosher or don’t know all the rules (and there are many; I wrote three blog posts just to explain the very basics! ), it’s very easy to screw things up. Discuss your plans with your guests and figure out how to handle the situation together. Why Not Just Eat Vegan? Bishul akum and pat akum: These are rabbinic strictures that prohibit the consumption of foods cooked and baked by a non-Jew. (This is not because we think non-Jews are impure or something, it’s just because keeping the laws of kashrut is so complicated that it’s hard for us to trust that someone who doesn’t believe in its importance and isn’t used to doing it will be careful enough about it.) There are some loopholes, especially for Ashkenazim, where if a Jew starts the cooking process by turning on the oven or lighting the stove, the stricture no longer applies, so theoretically you could get permission to do that–but if you’re Sephardi, no dice. Processed ingredients with additives: A very strict vegan restaurant may not use any spice mixes or oils that are not certified vegan, but you’d have to check and make sure. Vegetable oils require kosher certification because of the way they are processed. The only type of oil that doesn’t need certification is extra virgin olive oil from a reputable brand. Canned goods may contain additives that are produced from animals. Even baking paper needs certification because it’s sometimes treated with animal fats. Wine and grape juice: There is a particular rabbinic stricture prohibiting the consumption of wine or grape juice that has not been produced from start to finish by a fully Sabbath-observant Jew. This means that kosher wine and grape juice are fairly hard to come by. You’d need to be sure that the dish they’re serving you was not cooked with non-kosher wine or grape juice. In other words, unless you interviewed the staff very thoroughly and were very careful about what you ordered, you can’t be certain that what you’re eating is 100% kosher. In extreme circumstances there may be room to be lenient on some of the rabbinic strictures. If you’re in an area with a significant Jewish community, there may be a restaurant or two that has kosher supervision. However, be warned: solitary kosher restaurants have captive audiences and no competition, and they need to work with more expensive ingredients, so prices tend to be high, and quality is generally not great. There are, of course, exceptions; Eitan and I were pleasantly surprised by the quality of the food at both Shaq Shuq and BenBen Kosher House‘s café in Barcelona. Okay but seriously, let me take a moment to heap praises upon the Chabad organization for everything they do to make the world a more comfortable and accessible place for religious Jews. They send emissaries out to the middle of nowhere to establish centers for Jewish life and provide religious services for visitors and residents. If you’re looking for information about keeping kashrut in a particular place, contacting Chabad is a great start. They often will have catering services or ready-made Shabbat meals you can order. We contacted Rav Avi, the rabbi who runs the Chabad in Girona, before our trip. He gave us some helpful tips and invited us to make use of his kitchen during our stay in Girona. So what do you do if you need to eat and there are no kosher options around? The first thing to do is figure out what kind of local food products you can use. In the USA, you can walk into any supermarket and find many products that have kosher certification: merely search for one of the many kashrut certification symbols on the package. In Israel, almost every product on the shelves lists some kind of certification. (It’s basically only imported products in specialty stores you need to worry about.) In most of the rest of the world, you won’t necessarily find the information on the package. You have to have The List. Local rabbinic authorities draw up lists of products that are okay to consume in a given country. I found the most updated kashrut guide from the Madrid rabbinate and pored over it before we left. The gist was that options included imported products from big Jewish communities like France, the US, or the UK, or products that don’t require supervision anyway (as will be elaborated below). *Note: If they’re imported from Israel, they need certification because of mitzvot hatluyot baaretz issues. Supermarkets in Catalonia clearly marked the origins of all produce, but in places where they don’t do that, you can assume the produce is not imported from Israel unless otherwise indicated. No one will starve on that, right? You’ll notice there are three main categories of foods that most Westerners are used to eating and aren’t on this list: meat, dairy products, and baked goods. Outside the US and Israel, you can basically only find those things in specialty kosher stores like BenBen Kosher House in Barcelona. In other Western countries, you may be able to find imported products like Heinz ketchup and mayonnaise, Kikkoman soy sauce, and of course, the famous Ben & Jerry’s ice cream that served as my main nourishment during my previous trip to Barcelona. (Haagen-Dasz is kosher too.) Some places will have an “American section” in the store where you are more likely to find such products. Note also that in specific countries there may be no problem with other types of products, such as canned vegetables and beans, certain brands of milk and butter, etc. That’s what The List is for! Well, now that we have all this food, how do we make it edible? You can probably survive without access to a kitchen, especially if you’re only going to be traveling for a few days, but you’ll certainly eat a lot better if you can cook. For that reason, many kosher-keeping travelers opt to stay at an apartment with a fully equipped kitchen rather than a hotel. But you can’t count on that kitchen being kosher, right? So how can you use it? First off, all the pots, pans, plates, etc. that the food touches while hot need to be kosher. That means you’ll need to either bring your own pots and pans (and knife for cutting onions, garlic etc.) or buy new. Kashering pots and pans is more trouble than it’s worth for a temporary situation. At the bottom of this post I’ll include a list of recommended items to bring with you. Microwaves are very easy to kasher, because the way they work is by making the food heat itself rather than applying heat to it, so the walls and floor normally don’t get hot enough to be a problem. The only potential problem is the steam. So simply ensure that it’s clean and hasn’t been used in the past 24 hours, then fill a microwave-safe cup (paper works) halfway with water and a little dish soap and microwave it for a few minutes (until the inside of the microwave is full of steam). You can also cook in a non-kashered microwave if you double-wrap the food in plastic. Google is full of very creative microwave recipes, but of course you’re going to be limited by the ingredients you have. If you don’t have access to a stovetop, you can use a microwave-safe container to cook pasta, rice, beans, or polenta. You can poach eggs, too. So the thing about ovens is that they have to be sparkling clean on the inside in order to kasher. It’s kind of hard to clean an oven quite that thoroughly, especially if it’s in regular use (with the exception, of course, of self-cleaning ovens, which self-kasher when they self-clean!). To kasher an oven, you have to make sure there are no bits of food or crumbs on the inside at all (including the walls and ceiling of the oven–and this may take oven cleaner and heavy scrubbing), and then turn it on its highest heat for an hour or two. If you can’t do this or couldn’t be bothered to do this, you can still use the oven to cook things, it just gets a little more complicated. The easiest and surest way to get around the problem is to cook things double-wrapped in aluminum foil. That is, say, in an aluminum pan covered with foil, and then another layer of foil surrounding the whole thing. This is how airlines serve kosher meals on airplanes: everything that needs to be heated is double-wrapped and can therefore be placed in the oven along with the non-kosher food. The problem is that things can take forever to cook this way–and from what I understand, it’s not actually necessary to double-wrap if no non-kosher food is being cooked in the oven at the same time. A single layer of foil covering the rack, and a single layer of foil covering the food itself, can be sufficient–and if the oven is very clean, with no food residue on it, it may be okay to cook non-wet foods uncovered (a.k.a., foods that are mostly solid either before or after cooking). Opinions vary widely because there is a debate about whether and how much steam transfers flavor, so you’ll need to consult your rabbi. When in doubt, stick with double-wrapping and take into account that cooking time will be long. Because stoves apply heat directly to the pot or pan, they more or less kasher themselves–and because their contact with the pot or pan is on the outside, which is usually dry, there is less of an issue to begin with. With a gas or electric stove, turn the burners on to the highest heat for a few minutes, and you’re good to go. To be extra careful, you can cover the grates of a gas stovetop with foil. Unfortunately, induction stovetops are more of a problem. Ceramic is impossible to kasher, and so is glass if you’re Ashkenazi. They also only work with certain types of metal, so chances are whatever kosher pot or pan you bring won’t work on them. And unfortunately for us, induction stoves seem to be all the rage in Catalonia. I couldn’t find a suitable place to stay in Girona that had a different kind of stove! Our place up in the mountains, however, had a gas range, and we did all our cooking on that stovetop. If we hadn’t been able to find a place with a gas range, we might have brought a portable electric burner with us (something like this). Glad we didn’t have to! Theoretically, you can use non-kosher utensils to handle cold, non-spicy/strong-flavored food on an impermanent basis. It’s best not to rely on this, though, especially if you’re likely to be using garlic, lemons/lemon juice, or onions in your food. Best to bring your own stuff–metal or hard plastic. Don’t count on the mugs having been used only for coffee, either. People eat stews and soups out of mugs. We did make use of a wooden salad bowl at our apartment in the mountains, since it was just holding cold vegetables. You don’t really need to worry about countertops that are clean if you’re not handling hot or strong-flavored food on them directly. You might want to bring a cutting board or mat for veggies. Still, marble countertops can be kashered by pouring boiling water on them, as can metal sinks. If the sink is ceramic or otherwise unkashered, just be careful not to leave dishes or pots lying in the sink or rest the pot on the bottom of the sink while washing it with hot water. (Cold water is fine.) By the way, best to get a new, unused sponge, but as long as you’re using it with dish soap, it’s not a problem. There are a few key things you may want to bring with you, or purchase at a local kosher store, that will make it much easier for you and increase your options. Note that if you plan on cooking both meat and dairy, you’ll need to bring two sets of pots, pans etc. If you’re not sure you’ll have access to a kasherable stove, you can bring along an electric stove top or hot plate, and/or a sandwich maker or electric grill. Sandwich makers are more compact and don’t require a pan to use, but they will obviously limit you more (though you can cook eggs, fish, etc. on them, not just toasted sandwiches!). Fish: This is probably the easiest meal, because fish cooks quickly even when sealed in foil, and don’t need fancy flavorings to taste good. 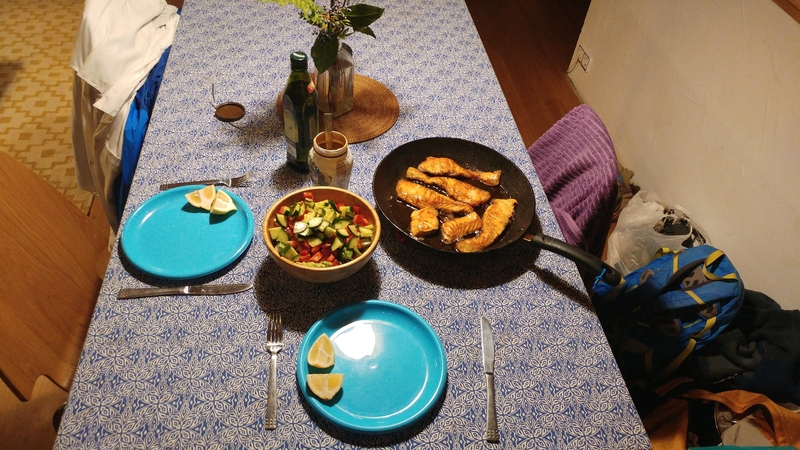 We picked up some fresh salmon fillets at a store in Girona, fried them in olive oil (seasoned with salt, pepper, thyme, and lemon), and served them with a fresh salad dressed with lemon and the tahini we brought along. I’m not in the habit of Instagramming my meals, okay? Legume stews, soups & salads: Lentils cook fast, don’t require soaking, and are nutritious and filling. Beans work too, but you’ll need to find them canned or otherwise soak them. (If you’re pressed for time you can use a quick-soaking method: cover the beans with water, bring to a boil, boil 1 minute, remove from heat and let them soak for an hour. Then drain, refill with fresh water and cook as usual.) Make a salad with other veggies, nuts, seeds, herbs, grains–whatever you’ve got!–and dress it olive oil, lemon, salt and pepper. Make a soup or stew with tomatoes, root veggies like carrots and sweet potatoes, onions, garlic, herbs, and whatever spices you can find. Eggs: Eggs are versatile and filling and cook quickly. We fried eggs in olive oil and toasted bread in the pan for a filling breakfast. You can make a frittata with veggies and grains; add boiled eggs to a salad; or serve poached, fried, or scrambled eggs over polenta or next to green beans, peas and/or other veggies. How about shakshouka? If you can’t find canned crushed tomatoes, you can cook fresh ones in a pan with onions, garlic and water until they’re soft and saucy, then add your eggs. Sprinkle fresh cilantro on top when they’re done. I suspect you could improvise this dish in the microwave if you don’t have access to a stove. Pasta: You might find pasta pretty boring without dairy or meat, but you can add some soft nuts like cashews and walnuts, or legumes, for protein. (How about throwing some pasta in one of the above bean or lentil salads?) If you can find avocados, you can make them into a creamy sauce with garlic, salt, pepper, lemon juice etc., and I bet that would be awesome with cherry tomatoes. Sauteed mushrooms are great with pasta, and so are sun-dried tomatoes. (You may want to soak them in warm water for a bit to soften them.) Many Italians eat pasta aglio e olio, and that’s a cinch to make–just lightly saute some garlic in a pan with olive oil, dump the whole thing on the the pasta and toss. Roasted stuffed potatoes and sweet potatoes: So you don’t have a lot of options for stuffing here, but this could be a good way to use up extra stew. Roast some potatoes or sweet potatoes in the oven, split them open, and fill with whatever’s at hand. Sauteed mushrooms would be a good addition here too. In terms of restaurants, we enjoyed lunch at Shaq Shuq and breakfast at BenBen (which, to our surprise, serves pareve and meat, not dairy, but was still good). There is another kosher restaurant in Barcelona right near Shaq Shuq, called Maccabi. There are also five hotels listed on this website under “accommodations,” but I have no idea whether that means they can supply kosher catering or just that they’re near Jewish institutions. We stayed at Hotel Zenit, which was a 10-minute walk from BenBen, and we were very comfortable there. We had more than enough food and ended up leaving a bunch for our Airbnb host! For more ideas on how to feed a larger family for a longer period of time and without access to a kosher store, you can check out this detailed blog post an American-Israeli friend of mine wrote about how she fed her family during their two-week trip to the Azores. Kosher-keeping readers out there–how have you handled similar situations? What creative ideas for meals have you come up with when you had limited access to kosher food and facilities? I’d love to hear in the comments!